Used To Us Being Together EOPM is provided for you and if you think it can be optimized such as adding the dynamics etc, welcome to provide us with the more perfect Used To Us Being Together EOP and EOPM! Used To Us Being Together is a song by Jerry Yan. 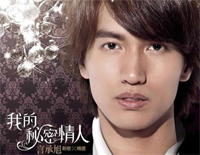 Jerry Yan (Chinese: 言承旭; pinyin: Yán Chéngxù) was born 1 January 1977. He is a Taiwanese actor and became famous as part of the "F4". His birth name is Liao Yangzhen.